Meet the MICRO CUBE RX Bass Combo Amp; it's small, loud, proud, and in true stereo! This amp overachieves with serious bombast in a small body. You won't believe how much this little combo can deliver through its stereo power amps and 4 newly developed custom speakers. This compact amp is equipped with high-quality, powerful sound. The cutting-edge speakers used in the MICRO CUBE BASS RX are custom designed and built specially for these amps. With two specially made power amps and four speakers contained in each, the RX amp produces an immersive, stereo sound that must be heard to be believed. The true stereo engine also allows bass tones that defy the size of the cabinet. This amp can run on battery or AC power (AC adaptor included). 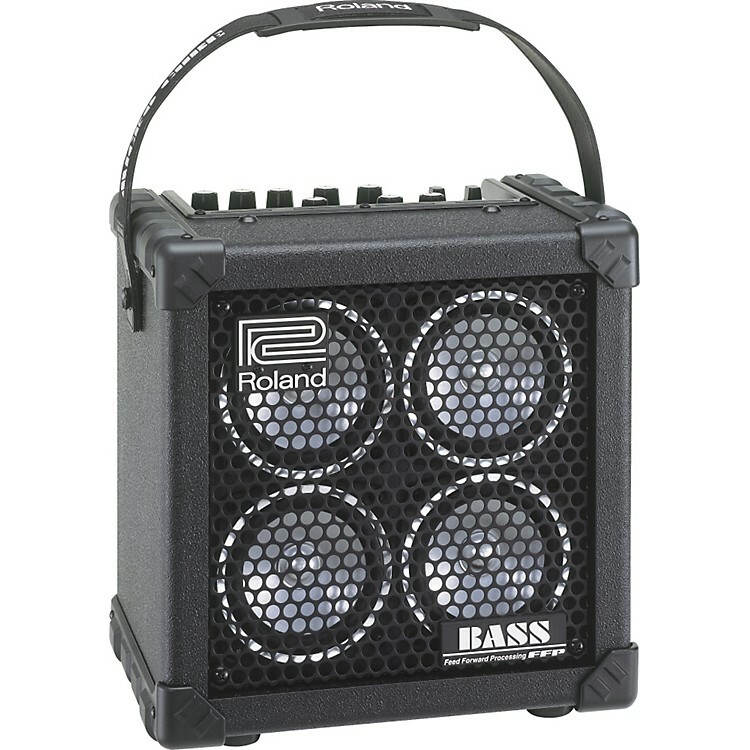 Guitarists and bassists have come to rely on Roland and BOSS for the best effects in the world. The MICRO CUBE BASS RX benefit from this world-leading technology, offering eight built-in COSM amps, six digital effects, 3-band EQ, and a chromatic tuner. Its onboard stereo effects benefit from Roland's decades of industry-leading R&D. Experience the amazing spatial depth and lush sound of the stereo Chorus and Reverb. The metronome is a music-student's best friend, but that numbing "clank, clank, clank" can get irksome. That's where the Rhythm Guide comes in handy. It's like having a drummer inside your amp. Choose from an assortment of groovin' patterns to practice with. Improve your timing while having a more enjoyable musical experience, or just have fun jamming along to the beats. The Phones/Recording output serves two purposes: Plug in a set of headphones and enjoy private practice with lush, stereo sound, or plug directly into a stereo mixer or recording device for accurate signal transfer directly from this amp. It has a line input that lets you plug in a guitar, bass, or microphone. In addition, the stereo AUX input accepts input from an iPod, a CD player, or musical instrument so you can blend its signal with your own.